The 3020-C is our prior location in the industrial park, however is no longer our warehouse location. Please reference our warehouse address when visiting us. 1a) If you are traveling south on I79 take exit 85 (formerly exit 26) Evans City. Stay to the left. It will be apx 5.1 miles to your turn onto Ogleview Road. 1b) If you are traveling west on 528 from Evans City. Make a left turn onto R19 south. It will be apx 4.1 miles to your next turn onto Ogleview Road. 1b) If you are traveling from I-76 (PA Turnpike), you will take Exit 28 proceed to Route 19 north off ramp. 1c) If you are traveling from Route 228, proceed until the end of the road to Route 19 north. You will be taking a right onto Route 19 north. 2) From the intersection of Route 228 and Route 19 you will travel approximately 1.2 miles to your first turn. 3) You will pass West View Savings bank and an unoccupied gas station on the left. Move immediately into the passing lane. Please note, you will see Unionville Road, but you can not directly turn on to it due to a barrier. Proceed to the next traffic light. 4) At the traffic light, turn left onto Ogleview Road You will travel approximately .2 miles. 7) Make a left turn into the parking lot. There are two sets of buildings, we are located in the bottom left. Stay to the right side of the parking lot and proceed down the small hill in the lot. We are the first door on the side of the building, connected to HITE Electronics and Supply. We've added a few pictures to expand on the final steps to get to our warehouse. 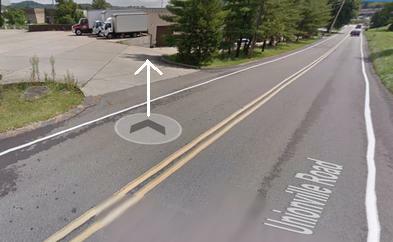 From the intersection of Unionville and Ogleview Roads, you will take a left onto Unionville (picture 1.) You will continue on Unionville for approximately .2 miles (picture 2). At this point, you will be approaching our building. Take a left into the parking lot at the industrial park (picture 3), and continue down the hill in the lot. We are the first door to the left. Look for the "Gourmet PA Systems" sign above the door, as well as the speaker shaped planter! Note: You can click on the pictures to enlarge them. This picture is taken from the front perspective. You will be taking a left at the intersection of Ogleview and Unionville.